In some rare cases, adaptations and interpretations of a literary work can surpass the source. Despite hundreds of valiant efforts on the part of fans, filmmakers, game/toy designers, and radio producers, this has never been true of the fully-realized fantasy world in J.R.R. Tolkien’s The Hobbit and The Lord of the Rings trilogy. (not that it’s ever been anyone’s intent). As we noted in a post last week, Tolkien’s fictional world is so intricate, its sources so vast and varied, that Corey Olsen, “The Tolkien Professor,” has made it his entire life’s work to open that world up to students and curious readers, most recently with his eight-part lecture series on The Hobbit. One might also add illustrators to the list of Tolkien interpreters above who have---in the almost eighty years since The Hobbit’s publication and sixty years since the first appearance of The Lord of the Rings trilogy---done their best to visualize Tolkien’s world. But perhaps no one did so better than the master himself. Long known as a visual artist as well as a literary one, Tolkien left behind over 100 illustrations for The Hobbit, one of which adorns 2011’s HarperCollins 75th anniversary edition of the book. He also created these original cover designs for each book in The Lord of the Rings trilogy. 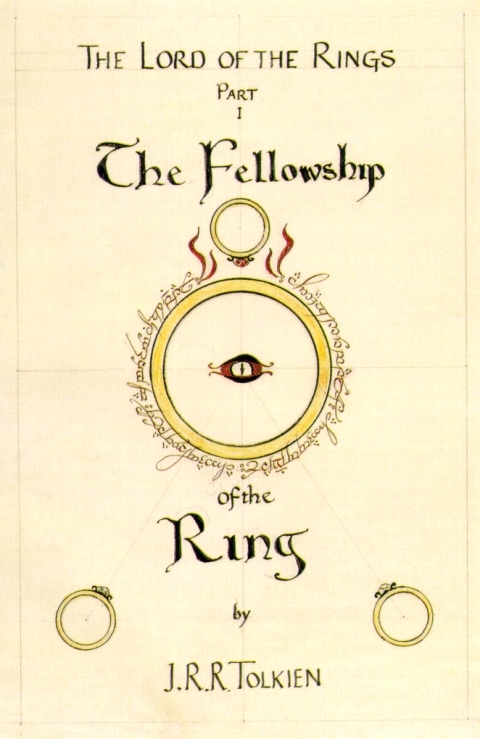 In the long and complex publication history of Tolkien’s most famous of works, it’s unclear if these designs ever made it onto books published during his lifetime, but the sigil in the center of The Fellowship of the Ring design (left), with its ominous eye of Sauron surrounded by elvish runes and topped by the one ring, did grace the elegant, minimalist covers of the first edition of the trilogy. 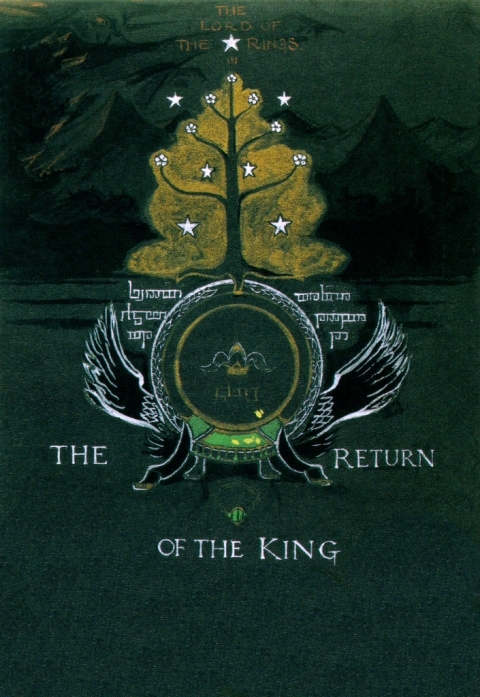 Tolkien’s artwork received a thorough treatment in a 1995 monograph J.R.R. Tolkien Artist & Illustrator, which covers over 60 years of Tolkien’s life as an artist, and the magic of flickr brings us this compendium of Tolkien illustrations. Thank you for interesting article. Just thought I’d make it known to you that the Danish Queen Margrethe 2. in 1977 illustrated a danish edition of Lord of the Rings under the pseudonym of Ingahild Grathmer. The danish queen is known for her work in arts. Um, I don’t usually bother with being a Tolkien geek, but….. the “sigil” design is not “topped” by the One Ring. The One is the plain band surrounding the Eye. The jewelled ring being drawn towards it through the flames is one of the other, subject rings – which makes the whole design even more meaningful. Well, sorry been a fan since I was a young girl..
Jem is correct. 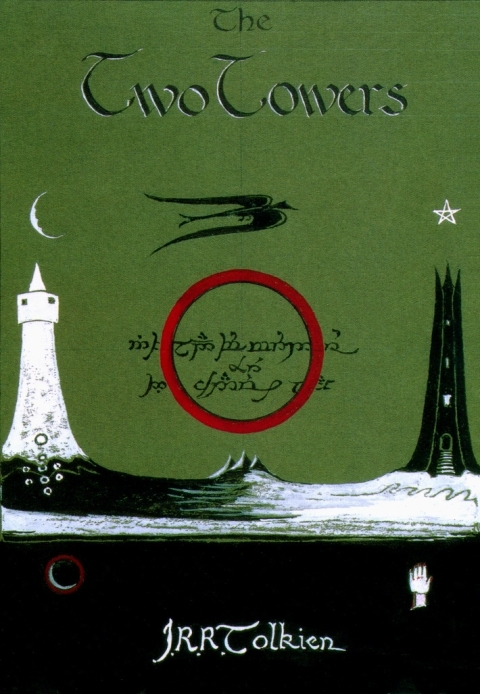 From the initial cover design it looks like the One Ring is surrounded by the three Elven rings. The reddish one on top is likely Narya, the Ring of Fire wielded by Gandalf. As a tribute to Tolkien, they should reissue the books with these exact cover designs.